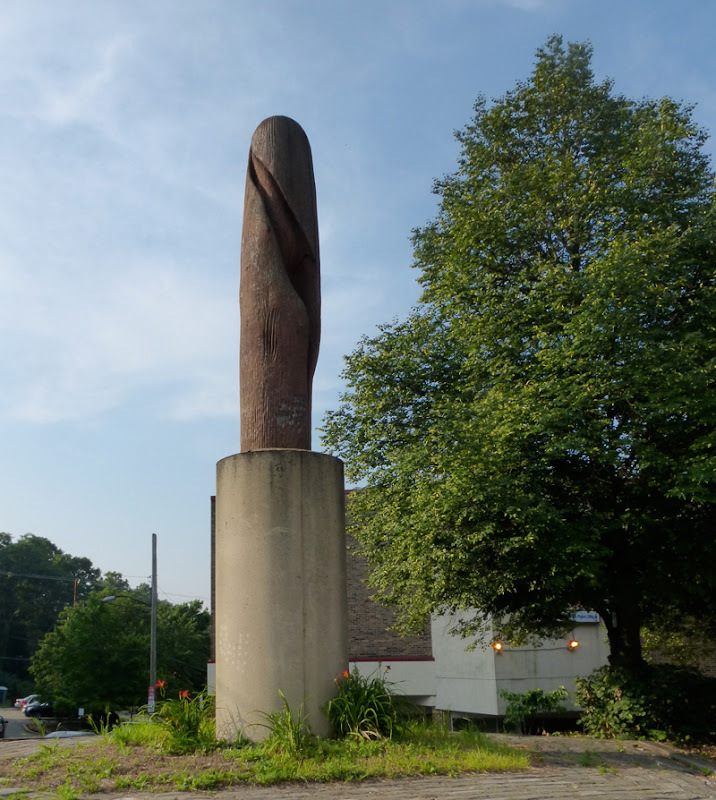 One of America’s most celebrated African American sculptors, Thaddeus Mosley works without preconceived designs. In an interview with David Lewis he said When I bring in a load of logs or blocks of stone I stack them up in my workspace. The logs are generally green and need to dry out. Every time I go to my workbench, I walk by them and get to know them better. The more I see them and re–stack them the more I see special characteristics in each one. One log may split while it’s drying, another may have a scar of rot, another a twist, or a knot. Similarly, stones have different grains, colors, textures. Gradually an idea begins to assert itself, and then I start to carve. Phoenix is one of Mr Mosley’s most well known works. It sits at a corner that was set on fire during the civil rights riots in the 60’s. 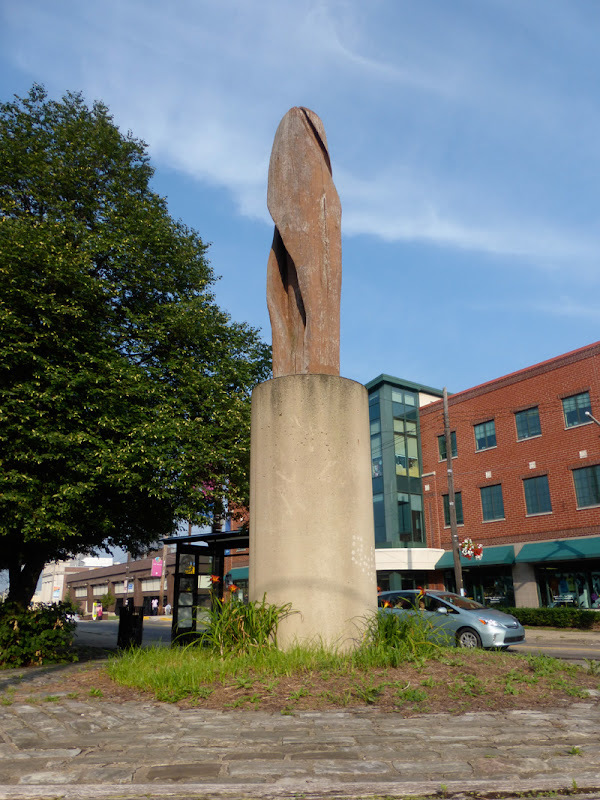 In the late 70’s the Urban Redevelopment Authority was trying to rebuild in this area, and Thaddeus Mosley was enlisted to create a piece of public art for the location. He wasn’t getting paid for this. It was a shoestring budget with no money available for artwork, but others offered to supply a log and to landscape a small parklet to install it. Mr Mosley then carved the 14' cedar log into what he named Phoenix . 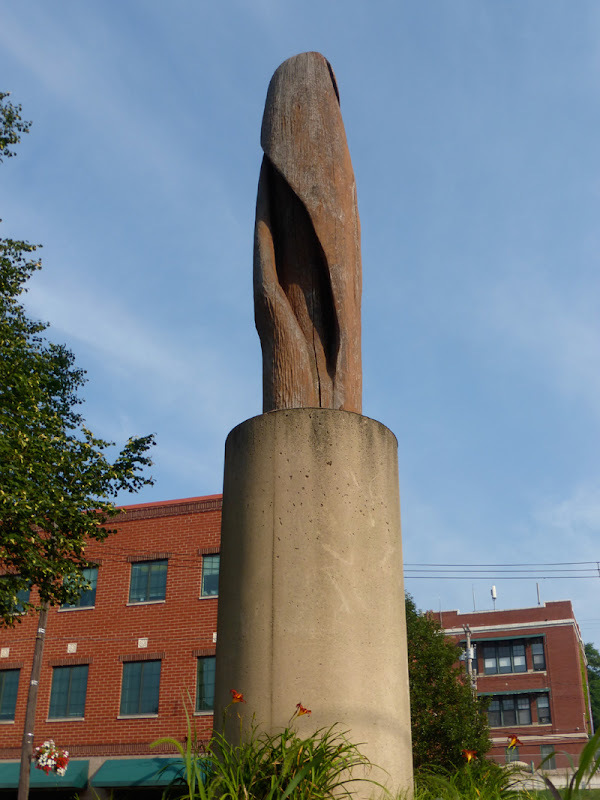 A sculpture that would signify the community’s rise from the ashes of the riots. In a Pittsburgh Courier interview by C. Denise Johnson, Mr Mosley describes his art as an urban Afro–American–Euro–Jazz influenced art. It is an effort to create works of vitality and identity which enhance space and transcend time. While not outside where you can bike to it or view it without paying an admission fee, Thaddeus Mosley has another piece of artwork on display locally that you might see if you visit the Convention Center. We thought we’d include it here. 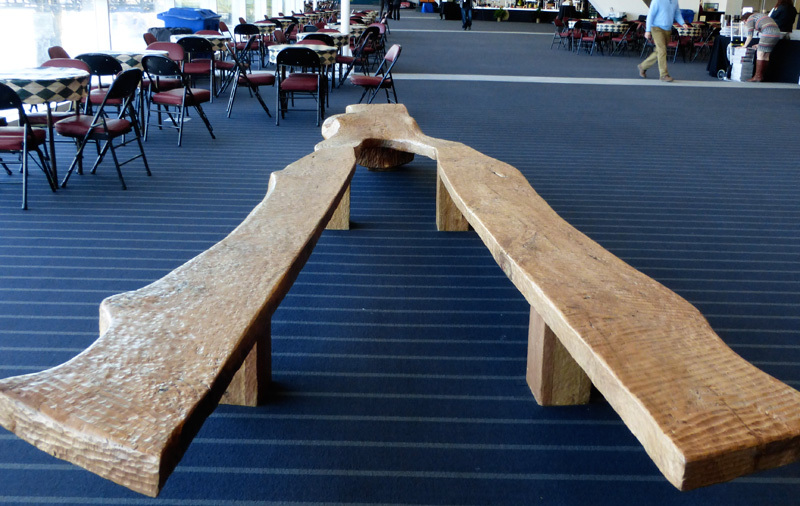 Three Rivers Bench is carved from black walnut and can be found on the second floor.